Personal: Lives in Hebron, Indiana with husband and dogs. Raised 3 wonderful children together. Hobbies: Showing dogs in AKC confirmation, gardening, and travel. • To be the best coach and team member possible. • To be able to develop structure, leadership, and mentoring through encouragement and positive support. • To have integrity in all interactions with customers and team members. 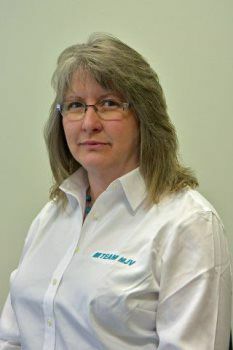 Cindy has 20 years of experience in the textile and customer service industry. Has achieved all her emergency management certification for the healthcare field and additional ones. Participated in Northwest Indiana emergency management district 1 training events. Sat on the emergency management board/team at a private hospital. Has earned her ICRA construction trades best practices awareness training certification. Worked in the healthcare EVS field the last 5 plus years finishing up as director of housekeeping. She has bloodborne pathogen and infection control training. Has written infection control policies and procedures and sat on the infection control board at a private hospital. Gone through diversity training, corporate compliance, regulatory compliance, adverse events training, instituted quality control measures in a healthcare environment and sat on quality control board. Have also instituted the use of PDCA’s with staff. Improved HCAHPS in a private hospital from 70.4% to 86.6%. Worked with biohazard control, linen services, and waste management. Has a working knowledge on CMS and EOC policies and procedure. Has gone through HVAP accreditation and JCAHO survey process. has written policies and procedures for them also. Basic hazcom and SDS training. Has training and experience in hard floor and carpet care. I hope to continue to learn, meet, and exceeded all expectations. Every day is a learning experience and it’s all about what you take out of any given situation and how you move forward. I am exhilarated to take on the challenge.